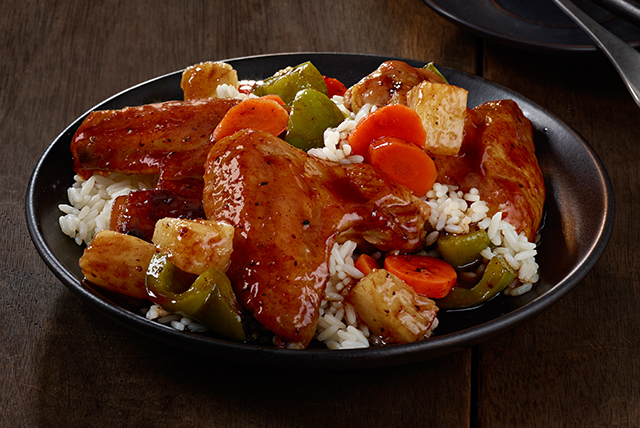 Turn good-time chicken wings into a family dinner with our Glazed Wings Recipe that comes complete with fruit veggies and rice for everyone to enjoy. Preheat oven to 400°F. Mix steak sauce and syrup; set aside. Place pineapple, carrots and peppers in foil-lined 15x10x1-inch baking pan. Top with chicken wings. Bake 30 minutes. Pour steak sauce mixture over chicken and vegetables. Continue baking 10 minutes. Spoon over rice. Look for green peppers that have a glossy surface, firm walls and are moderately heavy in weight.